JSI, in partnership with Brian Fulfrost and Associates (GIS specialists), conducted an assessment of food access in the City of San Jose, California, for The Health Trust (THT). The assessment identified food access resources and needs for two target populations: homeless individuals and low-income seniors. The project combined qualitative research with local safety-net providers and the target populations with GIS mapping of food access points (including the retail and food assistance/safety-net environments). Our assessment focused on the availability of the safety-net food assistance - such as hot meal programs, soup kitchens, and brown bag programs - and food retail environments to identify gaps in access for the populations of interest. During interviews with safety-net providers and other key stakeholders, we explored challenges and opportunities for improving food access. 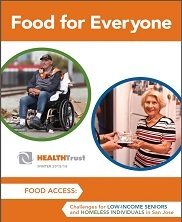 The final report Food For Everyone, describes gaps in food access for these populations and identifies potential opportunities for policies and programs to improve food access. These recommendations will help THT and the City of San Jose to develop a Food Access Plan in the future.